The farmhouse for Quorn Fields farm stands in the field between the Soar and the main road from Loughborough, reach from Flesh Hovel Lane. It was erected after the Enclosure Act Awards in the later eighteenth century. The ground floor windows were Victorian additions. 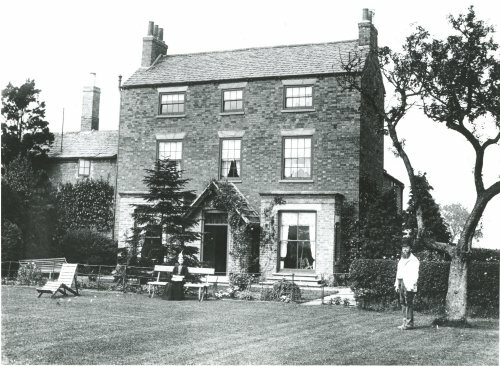 John Moss and his wife outside their house in 1899. Another version of this photo exists containing the typed text: When Percy Moss was old enough to manage the High Street Butchering business, John Moss commenced farming at Quorn Fields to which he removed in about 1885. The above photograph of John Moss and his Wife was taken about 1898, at Quorn Fields.